Switch out the ‘m’ in mole and what do you get? A vole, of course! Actually, the vole is more related to the mouse than it is to the mole. Also known as field mice, voles possess a stouter body, a shorter and hairier and slightly rounder head, smaller ears and eyes, and differently formed molars compared to the mouse and the mole. Their fur colours range from light brown to grey. If you’re not sure whether or not you have a vole or a mole problem, here’s how you can tell. Voles make holes. Moles, on the other hand, make mounds. Voles can create tunnels both underground and above-ground in the soil. 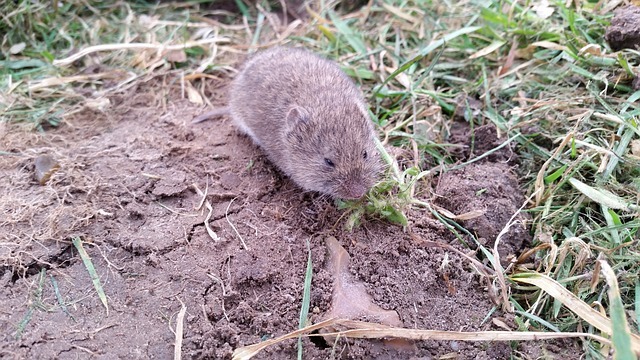 Vegetation is the vole’s main diet, meaning not only is your lawn grass at risk of being eaten, but also all of your fruit trees, prize-winning flowers and vegetables, and ornamental plants. That being said they are also fond of eating gypsy moths, snails, and the remains of other dead animals. Seeds, bulbs, tubers, and rhizomes are part of their fall diet which they gather and store for the winter. Voles are considered to be pests for a very good reason. They can be host to several parasites, including fleas, ticks, and lice, and thus they will spread diseases such as Lyme disease, Rocky Mountain spotted fever, and to a lesser degree tularemia and rabies (although the rabies part has yet to be confirmed…better safe than sorry to assume as much though!). Voles will bite if they are threatened by you or your pets if you own any, so beware if you get too close to one! Sometimes they may even end up inside the house (this is rare, but it can still happen). You’re most likely to discover you’ve got a vole problem in the spring, as they raise their young, usually 3 to 6 per litter, from March to early April. They have very few predators given their secluded underground lifestyle, but they can attract several predators including other pests you don’t want to find at home, such as skunks! If you’ve discovered a couple of holes in your prized flowerbed or your pristine front lawn or backyard, call your local Pest Boss to get your vole infestation eradicated. We’ll get you, varmints!